Does this kit come with the actuator as well? What is included in the 99213 Air Force One 2nd Car Kit? Can you tell me what this kit included? Is the actuator included? 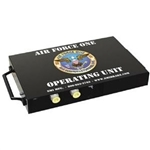 The Air Force One 2nd car kit includes operating unit, coach air connection assembly, break-away system, actuating cylinder, complete hardware kit, airlines & instructions in print & DVD.